best way to describe our products is for you to see it in action! 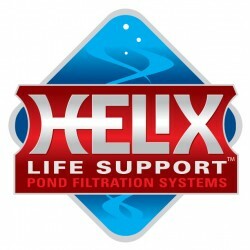 We now have a complete line of pond installation supplies at our office. pond skimmer units, and waterfall and pond underwater lighting. This new display allows us to show you each how each one of the water feature components work. We also carry many other brands of biological waterfall filters and pond skimmers. We can then suggest the best water landscaping system for your application. We also have various pond maintenance supplies on hand. pond alagae removers, and other environmentally safe chemicals to help keep your pond, waterfall or stream looking clean! This new fish aquarium is where Lox the tancho koi lives. Lox, is a Japanese imported koi and Aqua Eden’s official mascot. He loves to be hand-fed and we use him to test new aquatic plants for the pond. we first place a small test amount in the fish aquarium to see if Lox makes a tasty snack out of it. We are currently trying to find varieties of pond plants that koi do not like to eat. Lox loves to be hand-fed. We invite anyone to come by and feel Lox nibble at your fingers as you feed him! Our new office television screen will help us display pictures, diagrams and information in a way that is easier to understand. Whether you need a pond or waterfall quote, advice on how to install a pond or waterfall, or a tutorial of our online store, all of this can be displayed in full color on this viewing screen. In the very near future this screen will display our newest custom pond vision camera images for our backyard waterfall and pond! Come watch as wild birds take a bath in the stream or see koi swirl about the pond. All of this will be in full color and LIVE! Make an Office Appointment Today! We are often out of the office building ponds and waterfalls , giving pond installation seminars, conducting design consultations and many other Aqua Eden tasks. We would love to have you stop by our office, but please call us at 507-333-5959 or email us at jake@aquaeden.com to set up an office appointment. That way we can be sure not to miss you! Also, if we know what you are looking for we can be sure to provide the necessary information you need upon your arrival.